These Lenexa KS clients’ yard had no deck, but an older patio that they wanted to re-model. 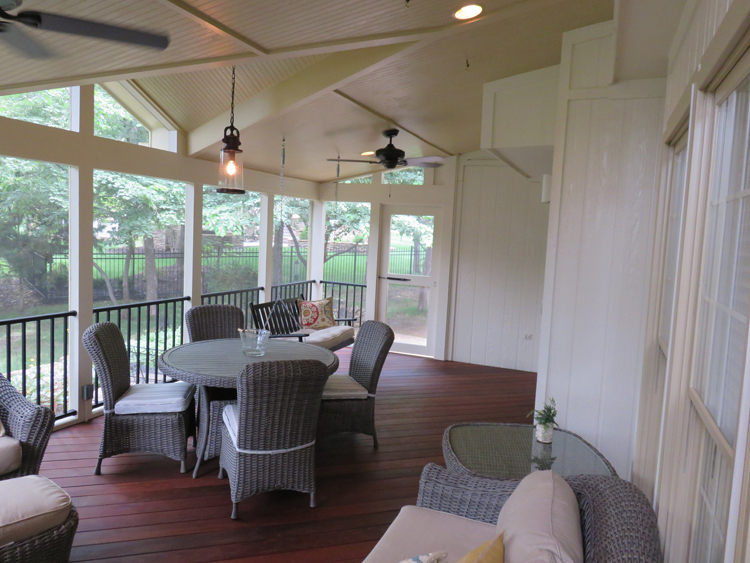 They wanted to enclose a section of the deck with a porch to extend their seasonal use of the space. They also wanted to make better use of a very shady sloped area of the yard. We designed a long rectangular space that matched well with the dimensions of the house and covered the challenging landscaping area. The next items on the list were spaces to accommodate an indoor porch swing, an eating area, and a fireplace. Fire and swings are not a safe combination, so we put the fire at one end and the swing at the other. In between we sketched out multiple seating areas so that the family could enjoy conversation by the fire and an intimate dining space. See more outdoor fireplaces by Archadeck of Kansas City! On the inside we designed an easy-access entry from the porch to the kitchen. We typically build these flush at floor height so that you don’t trip as you move in and out with trays of food and drinks. This also adds to the illusion that the porch has been there all along. We installed screened spaces all the way to the ceiling to maximize the sunlight available to the home’s interior. From the outside we created a gable centered in the middle of a sloped shed roof. The style fits with the home’s existing windows and the profile of the rear of the home. 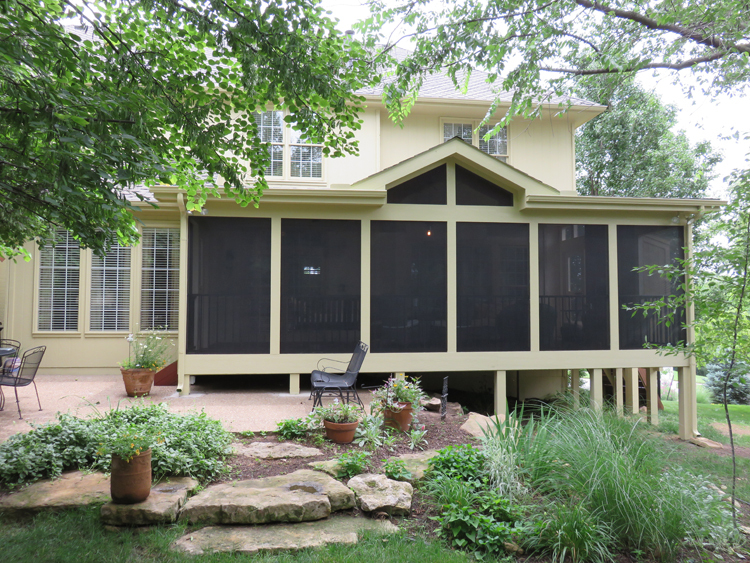 Lenexa KS screened porch looks original to the home. The interior trim is painted off-white. This neutral palette gives the owners enormous flexibility in furnishing and decorating. It also sets off the focal point of the room: the outdoor fireplace and floor that are constructed with Ipe– the king of exotic hardwoods. At the flick of a few switches, our clients control the wood-wrapped fireplace, the Lenexa KS screened porchceiling fans and various downlights installed around the three furniture groupings. 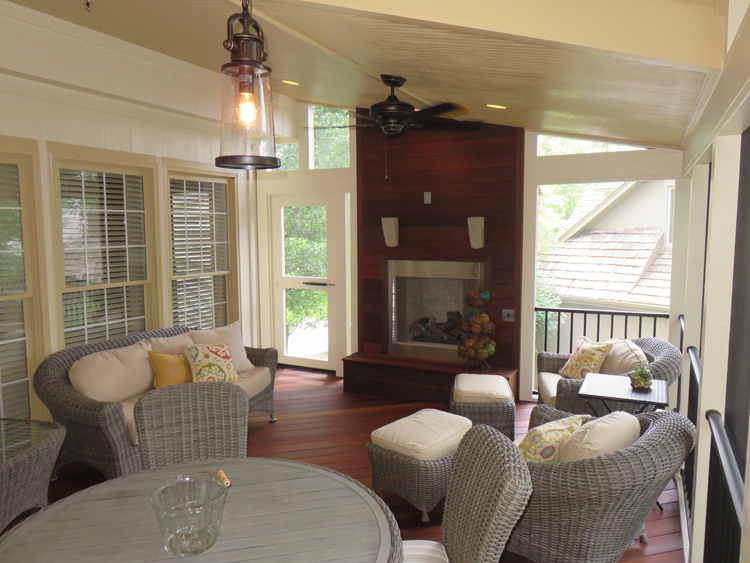 See more IPE Brazilian Hardwood decks by Archadeck of Kansas City! Other than the freshness of the paint job, there is nothing to give this porch away as “new.” The color, the architecture and the design are all consistent and complementary to the existing home. It’s still the home they love, but better: larger, more inviting and much more useable space for entertaining or relaxing. If you are interested in a Lenexa KS outdoor fireplace as part of a porch addition, give us a call for a free consultation. Give us a call at (913) 851-3325. Drop us an email at [email protected].